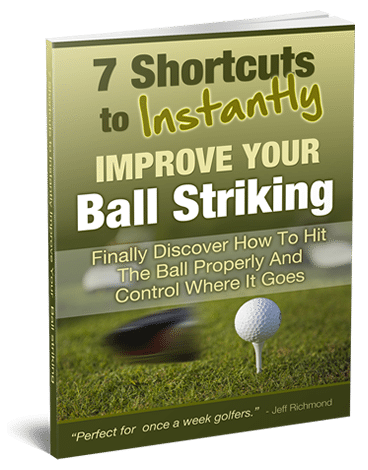 There’s no doubt about it… the way you grip the golf club has a big affect on your golf shots. Sadly, or fortunately (whichever way you look at it), there is not one golf grip that suits everyone. This is all too obvious when you look at the professional golfers swing and you see their grips are all completely different. For example, Ben Hogan had a weak grip. John Daly uses a very strong grip. Speaking about a strong and weak grip, I have a great way for you to find out what grip will work best for you. Get a semi-permanent felt tip pen and draw a circle about ½ an inch above every knuckle on your left hand. Then get a 5 iron and with your feet together setup to an imaginary golf ball. When you do this initially, practice making your grip to see what a strong (3 knuckles – that’s what you should see when you look down) grip feels like. Then try with a neutral (2 knuckle) grip and finally try a weak (1 knuckle) grip. When you do this it’s important that you do it with your feet together. Once you have experimented with each grip then hit some golf balls with each grip to get a feel for what each grip feels like and the shots you hit with each grip (bearing in mind that any grip that is different from the grip you’re used to will feel strange to you at first). It’s important for you to understand, however, that if you struggle with a slice problem you should favor a stronger grip. And if you struggle with a hook problem you should favor a weaker grip. That is a big reason why Ben Hogan used a weak golf grip. Having said that, the bottom line is to experiment until you find a grip that suits you. 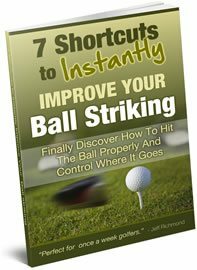 When you do make sure you keep a note of how many knuckles you are seeing, because that way if your ball striking goes south you can go back and check your grip first to see if it’s in the same position it was when your ball striking was good.